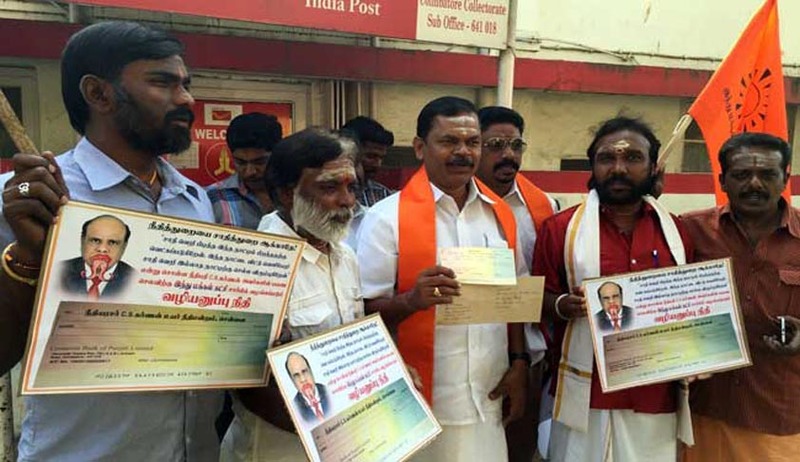 Tamil Nadu-based Hindu outfit 'Hindu Makkal Katchi' claims that it has sent a cheque for Rs 1 lakh to Justice C S Karnan the controversial judge of the Madras High Court to help him travel to a country of his choice where there's no caste system. This is pursuant to the comments made by Justice Karnan, who belongs to a Dalit community, on Monday. "I'm ashamed to have born in India. I want to move to a country without caste system. I've decided to give up my birth right," he said. Justice Karnan was restrained from hearing any cases by the Chief Justice of India T.S. Thakur in response to his unprecedented move in suo motto proceedings on Monday, staying his own transfer to the Calcutta High Court ordered by the Chief Justice of India. Arjun Sampath the Chief of the Hindu outfit said, "Judiciary is like a temple. He has vitiated it by saying there's discrimination against Dalits. He can use this money for travel. We can give him more if he requires." Earlier in a letter to the Chief Justice, Justice Karnan had alleged that he was left out of the Tamil Nadu State Judicial Academy as he was from the scheduled caste. He had claimed that all participants were from the upper caste and that his name was removed in order to make way for a Junior Judge who belonged to the upper caste. The controversy had started with Chief Justice Sanjay Kaul constituting the recruitment committee comprising of Justices V. Dhanapalan, R. Sudhakar, D. Hariparanthaman, N. Kirubakaran and R. Mala to interview candidates for selection as civil judges. The Tamil Nadu Public Service Commission chairman and other officers were to be part of the selection committee and it was scheduled to start oral interview of candidates from April 15 till April 21. On April 16, 2015, Justice Karnan initiated suo motu proceedings and passed a judicial order questioning Justice Dhanapalan’s inclusion in the committee. He also alleged that inclusion of Justices Sudhakar and Hariparanthaman, who hailed from the same community besides being relatives, would send a wrong signal about the fairness of selection. He went on to stay the CJ’s administrative order and restrained the public service commission chairman from conducting the interview of candidates for civil judge posts. Justice Karnan’s suo motu order was placed before a division bench which stayed the order. Despite the division bench order, Justice Karnan directed the Registry to place the matter before him. He went up to reiterating his earlier order and threatening the Chief Justice with contempt of court proceedings. The Madras High Court registry moved the Supreme Court seeking stay of the order passed by Justice Karnan. The Supreme Court had stayed the order passed by Justice Karnan. Meanwhile the Chief Justice of India issued an order transferring Justice Karnan to Calcutta High Court which was stayed by him in suo motto proceedings with a direction to the Chief Justice of India to file the reply by April 29. You may read the LiveLaw Story here.